Chef Adam D’Sylva, who runs the highly acclaimed Coda and Tonka restaurants reveals the places he likes to eat, drink and be merry in his hometown of Melbourne. Melbourne is without doubt the food capital of Australia. It is buzzing 24/7 with phenomenal culinary offerings, great wine bars and wonderful places to meet friends. For me (right now) it is all about Asian, and there are some gems across the city. The best place to start is the renowned ‘Golden Mile of Food’ in and around Flinders Lane in the CBD. It is here you’ll find my two restaurants (my work life pride and joy), Coda and Tonka, as well as a bunch of fantastic eateries serving delicious food from early breakfast to late night feasts. My first port of call most mornings is Cumulus Inc for the breakfast bacon bap roll with relish – my personal heart starter. Chef Andrew McConnell is a genius and you’ll find lots of great dishes across his many restaurants, including Supernormal or the wine bar-inspired Cumulus Up. The ricotta dumplings are off the charts (when available), while the nudi version of gnocchi are just sweet pillows of love and I just can’t go past the signature lamb shoulder. Madelines baked to order, rum baba with endless rum. What’s not to like? To enjoy upmarket Chinese with great service, perfectly executed food and an awesome dining room, go to Flower Drum. There is generous space between tables that allows you talk freely and not be part of the conversation on the nearby table. The ‘must have’ dishes are the Peking duck, assembled at the table, as well as an appetiser of the dim sum selection followed by pearl meat. The mud crab and seafood dumpling are also amazing. I always feel like a king when dining there, either for a boys’ lunch or a romantic dinner. I recently celebrated my 40th birthday there with a magnificent lunch that somehow (too easily) progressed all the way through to an early dinner. Great times. Trunk restaurant and bar is a funky beer garden, and a great place to catch up with friends, grab a bite to eat or even just take a break for a quick coffee. An oasis amongst the laneways of Melbourne, Trunk’s main dining room serves fresh and fragrant flavours of the Middle East and Mediterranean flavours. The beer garden is great for catching up for drinks after work or dropping past for a bite and the cheeky beer during the day. I like it so much, I got married there. For a cheap and cheerful Chinese that you can BYO, go to Pacific House, either in Richmond or Toorak. Consistent and affordable food including bullet proof Peking duck, soy chicken, crispy pork belly and whole steamed fish of many varieties from the live tanks. For the cleanest, tastiest pho, I Love Pho is a twice-a-week ritual for breakfast for me. I’m there when it opens at 9am for a hot aromatic broth with Thai basil and heaps of fresh chilli to kick start the day. While down Victoria Street Richmond, one of my favourite places to shop for Asian groceries is Minh Phat. It has everything you need. Owned and run by the famous Grossi family, Arlechin is a new hot wine bar serving late night supper and snacks. A world class cocktail list is curated by Joe Jones of Romeo Lane and Tonka fame. I like to dine upstairs at Grossi Florentino then pop round the back for an after-dinner drink at Arlechin. For a romantic night, enjoy one of the cosiest dining rooms in the city at Il Bacaro in Little Collins Street. An institution for over 20 years, it has service that’s always impeccable and never fails to impress. Out St Kilda way, Café Di Stasio is an institution and a place for all occasions. Top service with food to match. For an overnight stay when heading to the city or coming from interstate, Crown Towers is the perfect port of call. Luxury at its finest. 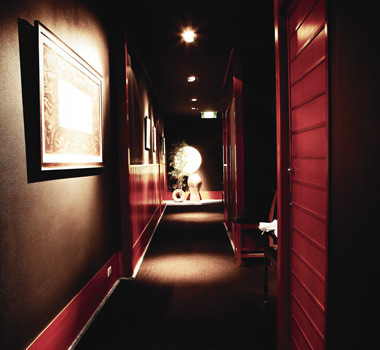 Fantastic spa treatments and a range of excellent restaurants. There are lots of parks and great spots by the Yarra to relax, but when I want to get away from it all, I head down the coast to the Mornington Peninsula, which I do on a weekly basis to have a hit a golf. After a quick round, I like to ease all the pain (from slicing all day) with a relaxing dip at Peninsula Hot Springs, natural outdoor thermal springs, before kicking back for the night at Polperro Winery. Their luxurious villas are stunning with open fire places – perfect for sipping winemaker Sam Coverdale’s world class Pinot Gris and Pinot Noir. Merchant and Maker in McCrae is the place for breakfast, the donuts are to die for. Their coffee is the best on the Peninsula and their short blacks are accompanied with a shot of sparkling mineral water. Nice touch. Celebrate la dolce vita or the ‘sweet life’ with the Nov/Dec issue of Selector magazine featuring our cover star and celebrity chef Guy Grossi. Join Guy as he discusses his passion for food, wine and a little mischief! To celebrate the Helen's Hill Ingram Road Pinot Noir 2015 being our April Wine of the Month, we caught up with Allan Nalder from Helen's Hill . What makes the Ingram Road 2015 Pinot Noir so appealing? To answer that I need to take a step back. All of our wines are 100% single vineyard and are all made at my winery. Only fruit that we grow on our vineyard goes into the wines that we make. It's not that we don't trust anyone, it's just that we don't trust anyone. We think this is super important. Come visit and I can take you to the very vines that make the wine you are going to enjoy. Call us "control freaks". I'll take it as a compliment. The Ingram Rd 2015 Pinot Noir benefits greatly from this approach. Pristine Yarra Valley single vineyard fruit, French oak maturation, careful "hands-off" winemaking and a great vintage all combine to produce a wine that expresses hallmark Pinot Noir characteristics. And its price point is extremely compelling. You have over 50 acres of Pinot Noir, what makes you so enthusiastic about this often-difficult grape? You're right, Pinot Noir is a difficult grape to grow and can really only grow well in specific, little tucked away corners of the world. The Yarra Valley, and the little patch of dirt I call home, is one of those places. It also helps to be a bit of a Pinot Noir fanatic. To me, it is one of the most remarkable red wines in the world. I once saw a quote about Pinot Noir growers from a wine writer: "its makers are lunatic-fringe, questers after the holy grail…" - Marc de Villiers wine writer. We fit that mould. Who is the Helen of the hill? We bought the property from Mr. Fraser in the mid 90s. He had owned the pasture land from the early 1950s. The reason he bought the land was because he fell in love with a woman called Helen, who wouldn't marry him unless he owned a farm. True love prevailed and he bought the farm. Sadly, Helen passed away some 6-7 years after their marriage. Mr Fraser never re-married and throughout the property inspection, he recalled many stories of Helen and her time there. From his stories, it was obvious that she had a passion for the land. We share that passion and thought it appropriate to name the vineyard after her. What makes Scott McCarthy a standout winemaker? To be blunt, the fruit. We live by the very old, well used, but absolutely true saying: "great wine is made in the vineyard". The most important decision we make in the winery is deciding when to pick the fruit. The rest of the process is relatively simple. Pristine quality fruit allows us to rely on natural fermentation, minimal filtering and minimal winemaking intervention. Our ethos is not to describe "perfection" as when there is nothing left to add, but rather, when there is nothing left to take away. We feel this is the key to winemaking. Ensure that we do as little as possible so we can deliver mother nature in the bottle. You also make a range of beers - why did you decide to go into brewing and what do you think makes a top beer? It gets pretty hot and sweaty picking grapes. Added to that, I ain't getting any younger, so after a big day in the fields a nice, cold craft beer is a perfect tonic. As winemakers and vignerons go, we drink a lot of beer, so it wasn't that hard to come up with the idea of brewing our own. Getting the recipe right, the choice of hops and quality malt is critical and keeping the fermentation process under control. The rest depends on what you like. We serve our brews at Cellar Door and luckily our customers reckon they're pretty tasty. What are the top 3 attractions you'd recommend to a first-time Yarra Valley visitor? The great thing about the Yarra Valley is the diversity. You can visit the YV Dairy and sample a variety of cheese, the Chocolate Factory, world class art museum, on-farm produce stores for things such as apples, strawberries, etc, 6 top golf courses, mountain biking, bush trails, historic buildings, micro breweries, gin distillery and of course the odd cellar door and vineyard restaurant. The valley really has a huge range of things to do. Obviously, a great place to start is Helen's Hill. Full al-carte restaurant on top of the hill with sensational views or our Cellar Door and casual dining nestled down in the winery amongst the vines. Room 10 is the best place in Sydney for coffee and breakfast . Andrew Hardjasudarma and his team not only make some of Sydney’s best coffee, but the food out of such a tiny space is nothing short of miraculous. My go-to is the classic soft boiled egg and avocado on toast, or any of the brilliant breakfast sandwiches - the slow cooked brisket with slaw and pickles is probably their signature. I also love the Brekkie Rice, which is perfect for a healthy start: creamed red rice, quinoa, walnuts and pepitas topped with dukkha. Chaco Bar is without doubt the best yakitori place in town, but it also has next level ramen – served Monday nights and Wednesday to Saturday, lunches only. Go for the chilli coriander – it’s spicy and full flavoured with such a fresh delicious cleanness to it. Add an organic egg: they are awesome! 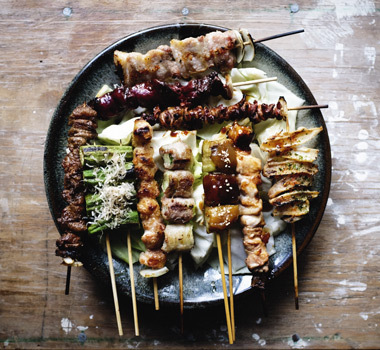 The yakitori skin is crunchy, smoky and creamy all at once and the wing and chicken meatball with slow cooked egg are a must. They also serve the best gyozas. Are you getting that I love this place? Wash it down with a beer and sake and say hi to Chef Keita, we’re lucky to have him in Sydney. Azuma is another terrific Japanese restaurant in the city owned by Kimitaka Azuma. Here we go for sushi and sashimi, which is so well made, and the best dish of all is the wagyu sukiyaki for two. We love sitting sipping sake as I cook our beef slice by slice in the boiling soy broth. We add tofu, bok choy, mushroom and spring onions, all the time cooking another strip of beef and dipping it, eating with rice and then at the end adding udon noodles to the broth. Such a great one pot dish. Masterful Dim Sum Another favourite from our own portfolio is Jade Temple . I love having the dumplings for lunch, made fresh daily by our Dim Sum Master, Dicky. They’re always so perfectly balanced in taste and texture and I can’t get enough of the roast duck either. Golden Century is famous for being a chef haunt and I was one of the first eating there along with Tetsuya way back in 1990. We all loved the place as it was open late and the food was always fabulous. All these years later, nothing much has changed, only I don’t eat late anymore, I’m in bed well before 3am these days! Sam and I love the green lip abalone steam boat. This is another great one pot dish for two people to share. We get noodles and tofu with it to make the perfect meal. The abalone arrives thinly sliced on lettuce and we have soy dipping and a little XO sauce. The slices are dipped for seconds and added to the soy in your bowl, then start with tofu, then noodles and finish with lettuce, just keep adding broth and seasoning to the bowl as you eat, drinking the soup from time to time. This is one of the world’s great meals, you may even see owners Eric and Linda wandering around. Fire in the Heart Mike McEnearney’s No. 1 Bent Street is a treat. It’s everything I love: no fuss, awesome produce, seasonal cooking and loads of love and care. Everything on the menu is great, but you have to try the bread, it’s possibly the best in Sydney, and anything off the grill or out of the wood fired oven, which form the heart of the kitchen. I love Mike’s touch with vegetables, so order a bunch of salad and veg dishes and eat one of the best plant-based meals in town.